I’ve been wanting a drone for so long! Recently I finally had the money to be able to pick one up. After much research in the world of drones for my price point, I settled in on the Parrot BeBop. I watched tons of videos, read review after review and made the decision to purchase one. It can be controlled with your phone or tablet using FreeFlight Pro, or you can opt for the Sky Controller for longer range. So what do I think of it? Let’s get started. Looking at photos of the drone is one thing. Actually holding it in your hands is another. The entire nose is made of styrofoam. The rest of the body is made of a hard plastic. Weighing in at just under a pound, it doesn’t feel quite as cheap as it looks in person. The biggest disappointment in the build is the way the battery attaches. There is a pair of wires with a connector on the end that you have to pull out of the body and physically plug into the battery. The battery then has slots that fit into groves on the back of the drone, but there’s nothing to actually fasten it in place, except a velcro strap that wraps across the top of the battery. I’ve never had a battery fall out, but it has worked its way a little bit loose a time or two. The physical controller is almost a must if you want to do more than fly around your back yard. Parrot calls it their Sky Controller. The controller is massive, and may be a little overwhelming at first. It is as big as it is because it was built to be able to handle having up to a 10 inch tablet attached to it for live video feedback. That works by connecting your mobile device to the controller’s WiFi and firing up the FreeFlight Pro app. Without the controller, you’re limited to the range of your phone or tablet’s WiFi signal, which in most cases isn’t all that far. With the Sky Controller, you can get up to 2km (or 1.2 miles) of range. So of course it will be much easier to get those shots from high up in the air, but you’ll be able to venture a good distance away from your own back yard, and still have a strong signal to keep control of the BeBop. Besides the added range, the biggest benefit to having the Sky Controller is the physical controls. On the phone or tablet, you have zero tactile feedback, which at least for me makes it difficult to fly exactly how I want. With the controller, you get physical joysticks that you can easily feel and control intuitively. 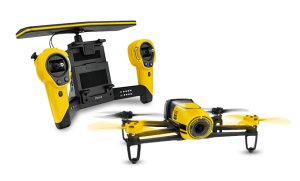 The Sky Controller also has controls for take-off and landing, emergency landing (which cuts the motors, causing the drone to simply fall out of the sky), and camera controls. It’s simple to use and is a must-have for serious flying. Whether you use only your mobile device or the Sky Controller, you always get a live video feed of what the BeBop sees while it is flying. More on video later. Most of what I might say about actually flying the BeBop has been said in the previous section. So here I’ll focus on the handling of the BeBop itself during flight. It is recommended that before every flight you perform a calibration of the BeBop (as well as perform a ‘flat trim’) and Sky Controller. This ensures the compass is calibrated to point in the right direction, and you have a good GPS lock, both of which are essential to keep the BeBop from losing control in mid-air. This takes about a minute to do, and is well worth it to have a nice, stable flight. I kept all of these values low to begin with while I learned to fly. Once I became comfortable with how the drone handles, I maxed out the numbers and now I can fly as fast or as slow as I want to. When you press the take-off button, the BeBop will automatically start the motors and lift off the ground about a meter high. It will hover there until it receives a command from you. Hovering is generally stable. Even in windy conditions, it does its best to stay where it’s at. Since it isn’t all that heavy, it is susceptible to the wind, but it fights it pretty well and stays in relatively the same spot you want it to hover in. Once you have that down, you’re pretty well on your way to having a fun, safe flight! The thing that had me concerned during my research was that stabilization bit. The fact that it was digital didn’t give me a lot of confidence. That is, until I saw some actual footage it could produce. I. Was. Floored. As much as the BeBop moves around while it’s hovering and in flight, it pumps out extremely stable video. Where you see the stabilization start to suffer is on a windy day when it struggles to stay in place – you’ll see some aliasing, especially around sharp edges, but otherwise even that isn’t so noticeable. On a sunny day, the video looks great – it’s clear, crisp, and again, stable. On an overcast day you start to see just a little bit of noise, and any darker than that, the noise becomes more apparent. So, you won’t be flying at night and getting shots of the night sky, but during the day you’ll be able to get some spectacular shots. Would I recommend this? If you’re looking to get into the drone market and want to take some nice videos in the process, I’d say this is a good buy. If you want razor sharp 4k videos, you’ll need to spend a few more hundred bucks for a DJI-caliber drone. But for the price point and everything the BeBop has to offer, I think I made a good buy. If you’d like to grab one for yourself, check it out on Amazon!